Looking to move to or from Macomb Township? Affordable Moving Services LLC can help. In fact, we have been moving people like you throughout Metro Detroit for more than a decade. Proud to be your trusted provider of all kinds of moves, we can accommodate anyone — whether you’re buying your first home, downsizing in retirement or moving your office. 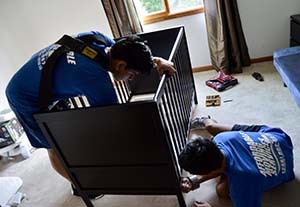 We specialize in seamless, stress-free moves thanks to professionals at Affordable Moving Services. We do everything when it comes to your move, from full-service commercial or residential moves to labor only moves. You’re going in the right direction when you hire our small family owned business backed by a decade of experience. Our trained movers, consistently working hard day after day, do what they can to ensure you don’t waste time stressing about the details. Time to move your home or office? Get in touch with the best movers in Macomb Township, a coveted northern suburb of Detroit located in Metro Detroit. Home to nearly 80,000, this is Michigan’s fastest growing major municipality. To get going on planning, obtain a free quote on services of all kinds. From loading and unloading to full-service moves, we are your preferred BBB Accredited Business, offering consistent quality services at amazing rates. No matter what you need — residential moves or commercial relocations — Affordable Moving Services will take care of the logistics while you worry about other aspects of your move. Many people simply don’t have the patience or time to pack their own stuff. In that instance, hire our trained experts who can bring packing and shipping materials to your home, with the main priority being to keep your belongings safe from beginning to end. We are proud to have a local company that brings local, personalized attention to all our moves. Our 10 years of experience translates to seamless services that offer our clients a cost-effective solution they can’t get anywhere else. Our headquarters is located in Rochester Hills, but we happily serve all of Macomb Township and beyond. We do all we can to protect your surroundings during the move, wrapping and padding your valuables, couches, appliances and more, as well as providing carpet shields at a small additional cost. We’ve been handling moves throughout Metro Detroit for more than a decade, becoming the provider of choice for people just like you. To learn more about our services in Macomb Township, please contact us today at (248) 260-7026 or email us at affordablemovingservices@hotmail.com.